Making and placing model railroad buildings on your layout is yet another component of this hobby that will allow you to explore and demonstrate your creativity. The simplicity or complexity and the time involved in developing and placing your model buildings on your layout or diorama can range from one extreme to the other depending on your interest and desire to create a realistic layout. Most of us end up somewhere in the middle of this spectrum. Your layout may not require a lot of buildings, particularly if you are modeling a desert or mountainous area. In this case, with the few model railroad structures that you have, you’ll want them to be as realistic and interesting as possible. 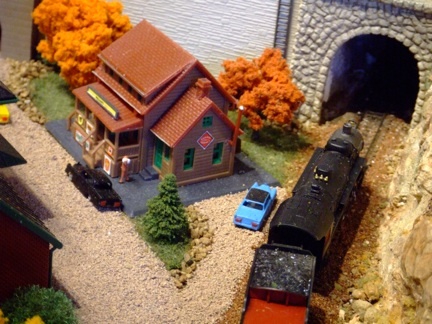 If your layout includes a city or a lot of small towns, you may find yourself requiring a fairly large number of model railroad buildings that may take a considerable amount of time to create. If you have been very diligent and organized in your layout planning, you will already know exactly what structures you will be putting on your layout and where. You will also know the exact scale sizes of your buildings and whether they will fit in the available spaces. If so then you can go ahead and lay the track and do the terrain first and add your buildings in as time permits. Some of us aren’t quite that organized. You may just have a general idea that you want to put a town here and an industry there, etc. In this case you may find that after the track is laid, you don’t have enough room for the model railroad building you wanted to use. That’s okay, though, because you can always kitbash the building to make it fit or build it from scratch. Another option, the one that I have used in developing my most recent layout, is to create many of the model railroad buildings first, before the track is permanently installed. I like this method because you can get an idea of how your structure will fit into the whole scheme of things in 3D, and also whether you will need to modify your track plan (e.g., add a branch line or runaround track) to better accommodate or service the structure. When thinking about what model railroad structures you want to have on your layout, make sure to use buildings that go along with your theme, era and locale that you have chosen for your railroad. It wouldn’t make sense to have a lot of inappropriate buildings placed haphazardly on your layout just to fill in empty spaces. One of the easiest ways to populate your layout with model buildings is to buy the already completed or “built-up” structures that are often available in your local hobby shop or online catalog. Some of these do not look very realistic without some modification, but if they are incorporated into your layout well and surrounded by the appropriate scenery, they may look great. Some of them are very well done and won’t require much modification, if any, although they may be a little pricey. Unfortunately, ready-made model railroad buildings are not commercially available in all scales. If your scale is O, HO (especially HO), N, or Z, you probably won’t have much trouble finding the model buildings you want for your layout. Even so, the size or the cost of these structures may lead you to explore other options. Many times, at model train shows, you can find fantastic model railroad structures that others have built and wish to sell. This is the primary method that I have used to create buildings for my layout. Most of them are not very expensive, are easy to build in 1 or 2 evenings, and can be easily modified before you put them together if you wish. Also, they usually look better than the ready-made structures. If you don’t like the color of the structure pieces as they come out of the box, you can airbrush the parts first and then put them together. This is much easier than trying to paint structures after they have already been built. Most of these kits are made with styrene, which is fairly easy to work with, and doesn’t require much skill. You just have to follow the directions closely that come with the kit. Laser kits are made with thin sheets of precut wood that seem to require a little more skill and time to do them well, but probably look a little better and appear more realistic on the layout. Some kits require a fairly high level of expertise. I wouldn’t start your model railroad building career with one of these, but they are fun to do and are very rewarding and realistic if you feel inclined to progress to the level of a model craftsman. 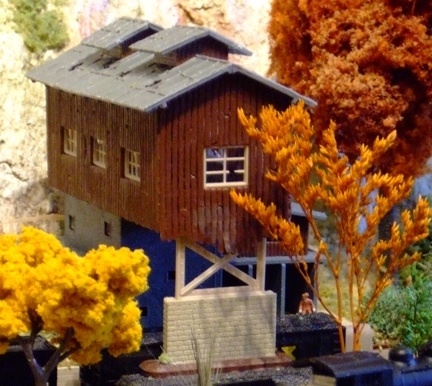 This method of creating model railroad buildings involves taking one or more commercially sold kits, and modifying them in such a way as to develop a completely new or unique structure. This may be as simple as cutting walls to make a smaller building that will better fit into a space on your layout. You could use this method to make a corner building to fit into a city block or between two tracks that form an acute angle that no ready-made building or kit will fit into. You may want to use 2 kits (either 2 of the same kit or 2 different kits altogether) and put them together in a way that forms a new building – perhaps a larger or taller structure than either of the originals. You could attach a smaller building to a larger one to make it appear as if an addition was added to the original structure years after the first structure was built. This involves creating an entirely new building from raw materials such as sheets of styrene or wood. It sounds like a daunting task, but sometimes it’s easier to do this than the other methods described above. •	If you see a prototypical building that you would like to have on your layout and you’re not able to find anything similar in the form of a kit. •	If you are modeling in a scale that doesn’t have many commercially available structures. 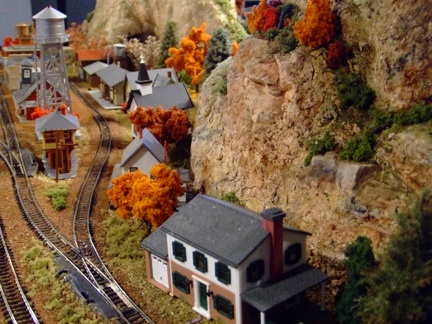 •	If you want to become a Master Model Railroader and submit your building to be judged in a contest. •	If you want to be creative and make a unique building that no one else has on his or her layout. •	And most importantly, if you enjoy it! You may even want to consider creating a design for the structure you want to build and sending it to a laser cutting service to make the parts. 3D Printing is another way to design and make your own unique structures. Click on the link to find out how. Painting, especially airbrushing, your structures, can greatly enhance the appearance of model buildings and make them look much more realistic than they would be otherwise. Weathering is also a very effective way of enhancing realism. Remember that your model buildings can be used to force a viewer’s perspective and make your layout appear larger than it is. You can do this by using smaller buildings (maybe even a smaller scale building) in the background and larger (scale-sized) buildings in the foreground. When the scene is viewed at eye level, it appears deeper and more three-dimensional than it would be otherwise. This has to be done carefully so that the smaller scale buildings don’t appear unrealistic or out of place. Sometimes, in the background, on a hillside or hidden among the trees or other scenery, you may want to create the sense of small buildings in the distance. One way to do this inexpensively is to buy or cut small blocks of wood to a size that would be appropriate for your scale and use them as distant structures or houses. You can put smaller and larger blocks together to create different shapes and sizes of buildings. Some of the buildings could have flat roofs or pitched roofs or be made to look like sheds depending on how you cut the blocks. Or you could add thin sheets of wood on top of the blocks to make pitched roofs. You can then paint the buildings different colors, paint on the doors and windows, paint the roofs black, gray or brown, even paint on some trim around the windows and doors if you like. You can then place these buildings within your background scenery to help add to the total effect of your layout environment. When you place your structures on your layout, you should make sure that you incorporate the structures into the surrounding scenery. Your building should not look like it was just plopped down on the layout. It should appear well grounded with no gaping spaces between the ground and the bottom of the building. The trees, grass, weeds and bushes surrounding the building should be placed realistically. It’s always nice to set up the layout so that when you dim the overhead lights, you can have warm lights visible in the windows of many of your structures. This creates the effect of a human element, that real people are living inside and using these buildings. •	Glue black construction paper or card stock to the inside of the walls (with the windows cut out of the paper, of course, to match the windows on the walls of the structure). This ensures that the light will not shine through the walls of the structure. Also, you may want to consider placing flat pieces of colored card stock diagonally from one corner to another on the inside of buildings to give the effect that lights are on in one part of the building and not all rooms of the building at the same time. You can use the card stock to create floors between the first and second floors for the same reason. Make sure the lights on the inside of the building are not visible from the outside. Place them high in the top of the structure, or hide them behind a half wall. Amber lights often work better because they put out a soft warm glow rather than a bright white light, unless you want that effect for a business building. Your light(s) inside your model railroad building should match the voltage of your power unit and should come up into the structure from a hole drilled beneath. The wires from each building should ideally go to a toggle or slide switch on your control panel so that different buildings came be turned on or off separately from the others. Your light bulbs should be somehow accessible so that if one burns out, it can be easily replaced without disrupting your scenery. Probably the best way to do this is to not glue down your roof to the structure so that when you need to replace a bulb, you just lift off the roof. There are lots of ways to create interior details that will make you buildings even more realistic. You can use decals available at your hobby store or online to make window shades. You could even create your own just by drawing them on a piece of construction paper, cutting them out and gluing them to the inside of your windows. You can cut out small pictures of the insides of restaurants or living rooms, etc. from magazines, and paste them on construction paper or thin sheets of styrene to place inside your building, so that when you look through the window, it looks like the insides of a real building. If you bend or curve these pictures concavely on the inside of the structure, it will create a three dimensional illusion when looking in from the outside. For additional details. add some scale furniture and people on the inside of the structure for even more realism. Paste a picture of a clock or other small pictures on the walls, add wallpaper, drapes, etc. The more detail, the better. Exterior details are important for helping your structure look real and appropriate for the scene you are modeling. For example, if you’re finishing a warehouse, you should have barrels and/or skids laying around, maybe a dolly, wagon or wheelbarrow. Don’t forget to have people and /or pets around. You should have some type of path or road leading to your building or running close by it. Otherwise, how are people going to get to it if it’s the middle of a forest or a bunch of weeds? Where are people going to park? Try to think realistically about how your building will be used. If it’s a farm, you may need a fence to keep the livestock in. So you can see there are lots of things to consider with respect to model railroad buildings and where to put them – all part of the fun - and another important facet of this very versatile hobby. From "Model Railroad Buildings" to "Homepage"